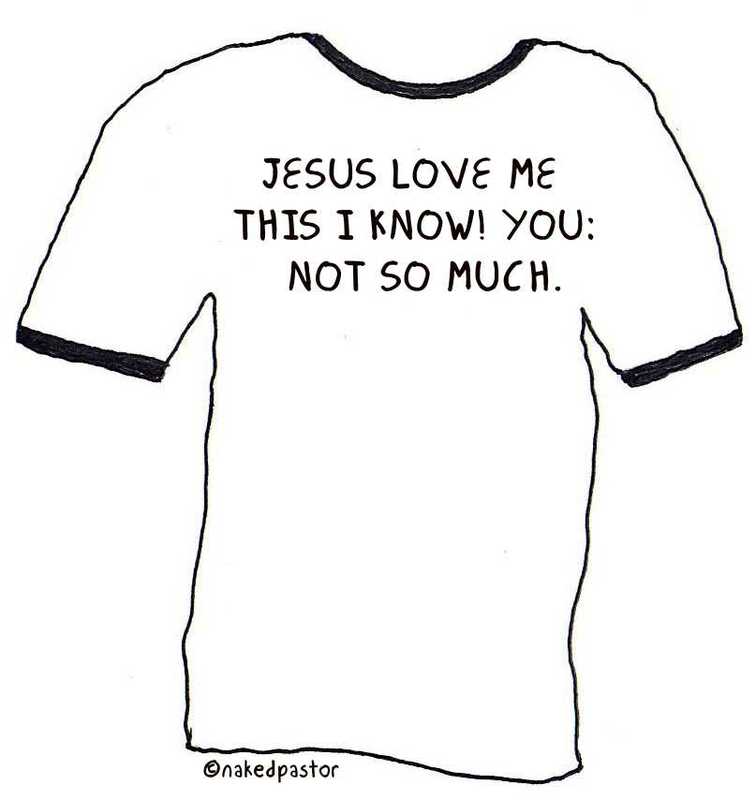 For some odd reason this looks pretty accurate for many people that I know in churchworld…if only it weren’t true! 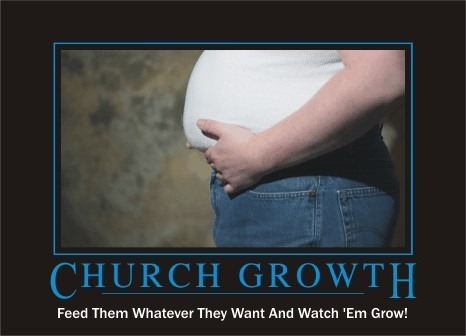 New Church Growth Ideas…thanks to another “Lutheran” Christ-follower! A Roman Catholic church in Ireland is attracting large crowds by offering a mass that only lasts 15 minutes. 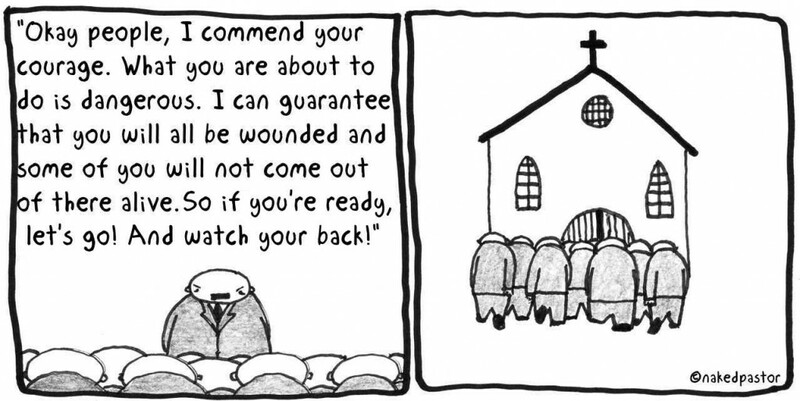 Basically, it cuts out the sermon and everything except a rushed-through Holy Communion. A church in a tiny Virginia town has gone nudist. sub-cultures–what else could they do? Addicted to Navel Gazing – Yep! We are obsessed with ourselves…that’s the bottom line. There isn’t a day that goes by where we aren’t thinking how life is impacting us…how it is affecting us and our plans…how we are going to get what we want…what steps we will have to take/what people we will have step on or use/or what schemes we have to pull off to make sure that our needs, wants and desires are met. OK…I’m not being cynical here…I’m just being honest that all the talk of “self-sacrifice” makes good homiletical material and looks good in a journal entry or blog post but everybody knows what really happens in most of our hearts. 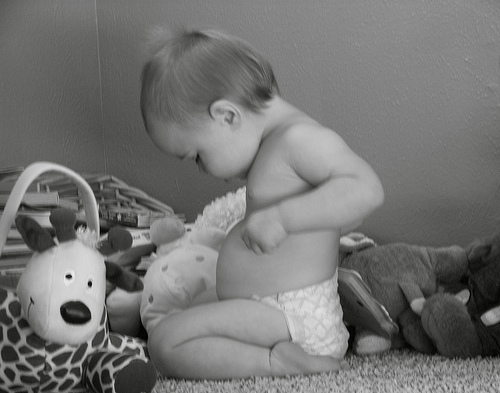 I’m amazed on a daily basis how easy it is for me to become a navel gazer…”how am I feeling today? What is going to make me happy? How am I going to get what I want? How can I appease my appetites today? How is ‘this’ situation effecting my hopes for the day?” As some one said to me a long time ago, it is all good that we are so focused as followers of Jesus in saying how the Kingdom of God sets our daily life’s agenda when in truth it really is the culture demands that come first. Now, when it comes to the journey of the “church”, this particular tendency is most blatant. Self-aggrandizement…self-promotion…self-focus is the prevailing rubric of most expressions of “church”. As I said, I’m not trying to be demeaning or condemning. I’m just trying to help us all be honest. Most of our time in churches is spent talking about our sermons, our worship experinces, our programs, the friendliness of our congregation, the faithfulness of our strategy to the Great Commission….and even more so, when leaders in most congregations get together, the majority of their time is spent on their committees, their infrastructure, their finances, their problems, the weightiness of their decisions. Each of us need to admit (and I’ve been there so I know) that if we put side by side a chart of some kind that spelled out how much time we spend in faith communities talking about “us” versus how much time we discuss or even take seriously what it means to purposely engage the culture and live out the call of God’s Kingdom that the numbers would speak for themselves. It’s hard to admit – but it is time to confess just as they do in recovery programs…”My name is you fill in the blank Church and I’m a navel gazer”. What would it look like for most of our time in faith communities to be spent not on talking about how we are going to be better or even more faithfully organized? When will our emphasis not be on circling the wagons in order to insure that we are protected and safe from that often “cruel” world? What would it look like if we weren’t so worried about ourselves and if we shared with our communities what life could look like IF we were focused more on “mission” than self or organizational survival? Navel gazing makes us all feel good…we love looking on the inside for that next and greatest ‘secret’ to organizational success…whether it is leadership development, gift based ministry, the newest and greatest bible study program…so much of our time is spent trying to get our house in order instead of taking the risk of seeing how our lives and communities can engage the lives of others on the outside of our communities that really don’t care about our programs, budgets, buildings or denominational issues. In the meantime, this means a lot to me…Lewis continues to challenge me in my journey…how about you? I was as sick as a dog a week or so ago and, since I wasn't feeling too good, I laid around and watched one of my favorite musicals on DVD…"The Phantom of the Opera". This operetta is deep, tragic and full of real life. I was talking with my wife after I watched it and I sharied with her the fact that movies or plays with tragic or unhappy endings are usually the ones we remember the most. I went through a whole laundry list of things that we had seen together to prove my point…between Saving Private Ryan, Romeo and Juliet, Gladiator, and Braveheart (just to name a few), it is the same story. There is something about those types of artistic expressions that simply feel right. Have you ever wondered why? Here's my quick take – it feels right because that is the way life is…not everything and every human story has a happy ending. What is real is unpredictability…struggle and pain…brokenness and desperation…sometimes joy and sometimes weariness. I watched the movie and said, "Yep, that's what more of us need..to see stories that don't end up where all the characters are fixed, rich, happy, healthy, stable, famous and fulfilled. We don't need the discouragement. Complete and total victory is NOT something that is guaranteed this side of the eternal Kingdom. What is predictable? Jesus. As we journey through this life, Jesus is the only ONE whom we can surely bank on. He and His Kingdom provide the only hope that can transform the shattered dreams and broken lives that accompanies most of what we call living. Why doesn't someone start a church with the name, "Messy Lives Community Church"? You know, as I look at the community that shares my journey that could be the story of our shared experience…messy. Messy but not alone. Messy but hopeful. Messy but touched by mercy. Messy and experiencing healing that will continue throughout the span of time. I'll close with this thought: if someone is promising complete fulfillment and peace; ideal marriages and children; if someone is saying "just do the following and you'll have the abundant life that Jesus promised" as if the Word of God was some sort of secret key to giving US all we ever wanted in this life; if those things are happening to you, run the other way! Life isn't that simple…life isn't that predictable…life isn't that mechanistic. If it was, I think Jesus wouldn't have wasted his time on earth hanging out with people whose lives were complete messes. He would have come to earth when He could have gone on TV and radio and pushed a simple product that gave a quick and painless way to experience all the life that we've ever wanted to experience. Wouldn't you think that God loves us enough to give us a formula if one existed? OK OK, we’ll do it! The “to read or not to read” question is answered! Ok – my buds, Henry, Mikey, Dave, Ken, and maybe a couple of others will jump in for the McLaren read. After all I've been reading ABOUT it, I'm a bit hesitant and apprehensive, but there is NOTHING like talking books and theology with these guys. Henry is someone I'm really impressed with…check out his blog and how he is trying to give Children's ministry a missional, fresh spin. Besides that, he is a Canuck! Mikey, what can I say – he's my "lil bro"…smart, inquisitive, funny and insightful. His blog is here! He's had more "bipolar" experiences in "churchworld" than most of my other friends combined. Dave, he's one of my best friends…well-read, opinionated, intelligent, positively argumentative; all the things you love in a pal. Ken is a great guy…loves good beer, good food and new ideas. 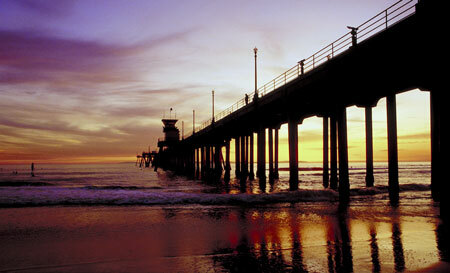 So, I guess I have to jump in…I'm going to try to convince my kid Aaron to go for it too! It seems like we have more debates these days about theology, ministry, worldview, etc. Good for a father/son relationship – there is ONE thing we agree on – expensive musical equipment that fulfill our dream of the perfect tone! Oh well…we all have to have one unrepentant sin to struggle with! So - here's our tact – get the book fellas – we'll set out a reading schedule next week! We all need to be reminded of the fleetingness, fragility, and brokenness of our humanity. Without the reminder, we fall into the traps of pride, arrogance, self-righteousness, and narcissism. Wasn't it Micah who said: "do justice, love kindness and walk humbly with your God"? Should be the mantra for today and life! Yep, the annual pig fest of culture. 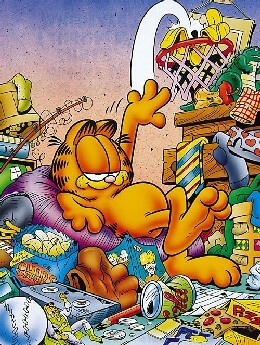 I guess there is nothing wrong with having a day dedicated to indulgence…the problem is that in our culture, every day is a day of indulgence. All you need to do is travel overseas to see how everything in our culture is excessive…super sized not just in terms of food but in just about every area of life. So, if today is a day to take a serious look at our indulgent lifestyle and to begin to take a step into the arena of repentance and renewal of life…then so be it! Truthfully, every day should be one where a follower of Jesus takes a good, ruthless look at their life to see what “indulgences” need to be placed under the cross of Jesus. Words and concepts like “self-sacrifice”, “delayed gratification”, “moderation”, “being emotionally and materialistically composed” – these things need to be more of a daily reality for most of us instead something that just comes up during the season of Lent. By the way, I wrote a bit of a reflection, study sheet, challenge for the Lenten season that you can take a peak at if you want – I wrote it in a manner that could be downloaded and utilized in just about any setting – click here and download the document “Ash Wednesday and Lenten Discipline”. To Read or NOT to Read – that is the question! Ok – many of you know that I am an avid reader…never was when I was a kid unless, of course, you counted Mad Magazines and Comic Books. Reading simply wasn't a value in our home growing up…BUT IT IS NOW! Times have changed…my lovely wife actually fed my addiction by buying me a Kindle for Christmas…so, now not only can I buy new books but I can get them at a discount and carry dozens around in a small vinyl case. 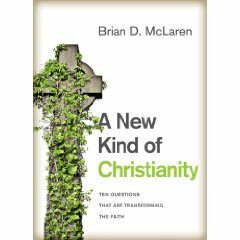 Anyway, I've been contemplating whether I want to read Brian's new book…I loved the early McClaren books (especially New Kind of Christian, More Ready than you Realize, Generous Orthodoxy)…wasn't too crazy about the newer reads. But this book is garnering some controversy which makes me feel like I want to jump in. The fact that Brian is now a big Marcus Borg fan is even more intriguiging. Anyway, I have some former students and some other friends who are reading it and debating some of Brian's thoughts…so now, what to do? So – here's my thought – I'm in with the book IF AND ONLY IF I can go through it with a few other peeps on my blog or email…so, this is what I thought I would do – TODAY is Monday, February 15th. I'm going to put out the word through this blog post – if you want to read the book along with me (maybe we'll take a chapter or so a day) and engage in some "gracious" discussion, let me KNOW NOW! I'll cut off my informal invitation by the end of this week! If noone wants "in", I'm not going to read it (at least for now)…if we get a few of us that want to go through it together, I'll jump in! So, what cha think? Sometimes it is so easy to fall into spiritual pride, isn't it?